"Technology has fundamentally changed how we can be together!" With this phrase Nancy White started the webinar 'Thinking about online communities using the Digital Habitats Orientation Spidergram', which was held on the 21st February 2012. 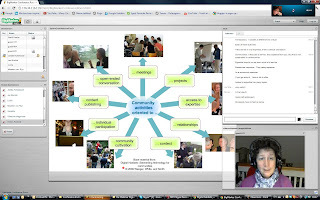 Nancy: "Technology has enabled us to communicate by distance through skype, bigmarker, e-mail, blogs, discussion groups and other social media tools. Some of them work effective, others are less effective. It depends on the situation. The world of the 'paper and pen' has transformed into a new world of digital tools. That has created a new dynamic on how we communicate in communities. If technology is not working we use paper and pen, other times we use the computer, preferably applications that remind us of the 'paper and pen'." 1. Start with research: Check if there is an interest and energy to start an experiment with social media. Check assumptions if the members think the same, as the head office of the network organisation. 2. Initiate an experiment: If there is interest, start with a small group of enthousiastic members with an experiment. 3. Expand the network gradually: Build an identity, have clear topics for discussion, create and maintain an attractive online discussion space and start to expand from there. Facilitation as 2nd profession - a handbook with useful hints for facilitation!